Aston Martin, the luxury British sports car brand favoured by fictional spy James Bond 007, said Thursday that its upcoming stock market flotation would look to value the group at up to £5.1 billion ($6.7 billion, 5.7 billion euros). The glitzy carmaker's latest starring role will be on the London Stock Exchange in October, the group revealed in a statement, in a plot twist that will make it the only listed British automobile manufacturer. The part-flotation of Aston Martin—whose top-end cars are cherished by Hollywood actors, global sports stars and British royalty—will carry a price range of £17.50 to £22.50 per share. "By becoming the only automotive company listed on the London Stock Exchange, Aston Martin Lagonda will provide investors with a fitting opportunity to participate in our future success," chief executive Andy Palmer said in a statement. The group will sell 25 percent of its share capital or almost 57 million shares. Final pricing is expected on October 3 when conditional dealing will start. The vehicles have a long-running association with James Bond, having made their debut in 1964 film "Goldfinger" and more recently in 2015's "Spectre". The carmaker does however have a troubled history, having declared itself bankrupt multiple times. 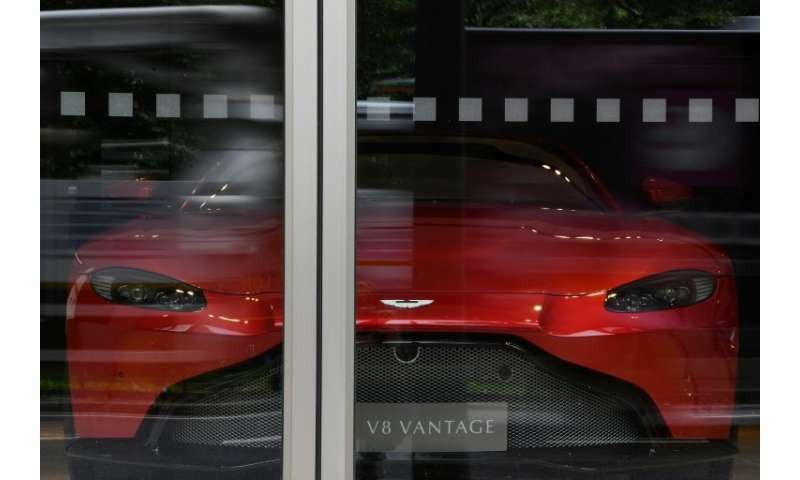 "Aston Martin has a chequered past, having gone bust seven times in its 105-year history, though recent performance seems to be turning a corner," said Hargreaves Lansdown analyst Laith Khalaf. "The luxury carmaker is looking to ramp up production, expanding into the SUV market and building its presence in China. "The key to success will be increasing the number of models on the road while maintaining the exclusivity of the brand. "On that front, having the world's most famous fictional spy as a brand ambassador is an asset most marketing departments can only dream of," Khalaf added. Palmer also said Thursday that the company's turnaround over the last four years has had a "profound" effect on the UK economy, having invested in manufacturing and engineering—and creating thousands of jobs. The hotly anticipated initial public offering (IPO) will value it at between £4.0 billion and £5.1 billion, targeting institutional investors, employees, customers and owners' club members. Aston Martin, which was founded in a small London workshop, has been transformed into an ultra-luxury brand whose classic car owners include heir to the British throne Prince Charles. Based in Gaydon, central England, the company is controlled by Italian private equity fund Investindustrial and Kuwaiti investors. German carmaker Daimler also holds a 5.0 percent stake. Aston Martin boss Palmer recently sounded the alarm over the possibility of Britain crashing out the European Union next March without a divorce deal. Brexit is "a disaster for the industry on both sides of the Channel if there is no negotiated exit", he told the Mail on Sunday newspaper. The UK's wider car manufacturing sector has repeatedly warned about potential Brexit fallout. While Britain has a strong automaking industry, the brands have fallen into foreign ownership over recent decades, with Germany's BMW buying Rolls-Royce and Mini, Volkswagen taking control of Bentley, and Jaguar-Land Rover being snapped up by Indian giant Tata Motors.